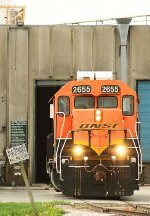 Title: BNSF 2655 GP39-3R at Mid America Car. Title: BNSF 2047 & 2655 on the station house track. Description: Private cars "Silver Rapids" (ex-CZ/PRR sleeper) and "Silver Solarium" (ex-CZ/CB&Q dome obs) on Train #3 the Southwest Chief enroute to Los Angeles pause at the Lawrence, KS station. Description: After Amtrak #4 rolled through, the Lawrence switcher backs onto the mainline to run to DeSoto AND help the local track foreman remove a tree from the siding east of Lawrence. Description: Here's the Lawrence Switcher running from mp 26 to the business park at 29 on the west side of Lawrence. That's Mass St. in the background. Description: BNSF 2295 and 2655 showing off the old and new paint schemes next to the Lawrence depot. Description: Day before L CHI107 headin back. Description: Apparently they picked up two geeps off Thursday nights local at the TZPR pit. Description: Day befores L CHI107 heads back west. Description: BNSF 2655 rests between assignments at Rochelle, IL. Description: BNSF GP39-3 #2655 is seen performing switching operations in the Metra Chicago yard, taken from Amtrak train 380.